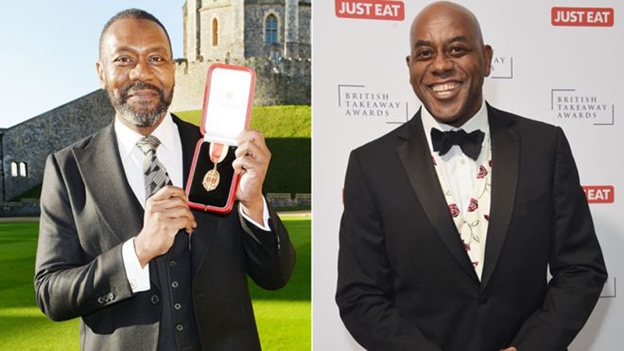 ITV said its piece had been meant to "celebrate Sir Lenny's significant achievements"
ITV has apologised for showing a news item about Sir Lenny Henry receiving a knighthood that briefly featured footage of TV cook Ainsley Harriott. The gaffe was picked up by a number of viewers, among them Sanjeev Bhaskar, who suggested the broadcaster had "misunderstood diversity issues". ITV News blamed the mistake on "an error in the production process". 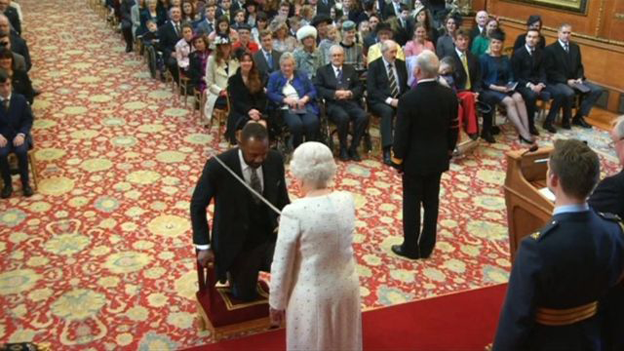 Sir Lenny said he was "very thankful" to receive a knighthood from the Queen for services to drama and charity. The Comic Relief co-founder has often spoken out on the subject of diversity in the media, a topic he was again asked to comment about on Friday. "We've made progress as far as on-screen representation is concerned," said the 57-year-old following the investiture ceremony at Windsor Castle. "But there's a lot of work to be done in the furthering of diversity behind the camera." "ITV News apologises for the error broadcast in the lunchtime news package today regarding Sir Lenny Henry's knighthood at the palace," said an ITV News spokesperson. "This was the result of an error in the production process in a piece intended to celebrate Sir Lenny's significant achievements in British entertainment." BBC News has contacted Ainsley Harriott for comment.